The Argentinian artist Marcelo Lavallen who last year decorated so beautifully the altar in the chapel of the St Barnabas Society has made a return visit. He has just completed a new crucifix for us and, as I write, he is in the process of painting (or to put it more correctly “writing”) an icon of Blessed Cardinal John Henry Newman and Blessed Dominic Barberi. The Archbishop of Birmingham will be visiting the Society on Saturday, 27 July, to celebrate Mass for us and to bless the crucifix and icon. He made a visit to Wolvercote shortly before I took up my appointment and it will be lovely to welcome him to our new location on the outskirts of Littlemore. The timing of Marcelo’s visit could not have been better as Blessed John Henry Newman is almost certainly to be canonised later this year. To have an image of him and of the saintly Passionist priest who received into the Catholic Church in 1845 will be a very special blessing for us not least because we are now based within walking distance of where it all happened. Marcelo is uniquely gifted and we are very privileged that he has so readily agreed to undertake this project for us. We hope that in time his beautiful artwork will help to attract more visitors to the St Barnabas Society – clergy and laity – so that they can join us for the celebration of Mass and we can talk to them about the work we do. Any Catholic priest in good standing is welcome to celebrate Mass here and anyone may join us for Mass each day. Please do not hesitate to contact us if you wish to do so. The crucifix has yet to be hung but the accompanying photograph shows very clearly how much research Marcelo has put into it as well as the skill he has exercised in painting it. The Lord Himself referred to His Death as “a baptism” – “There is a baptism I must still receive, and how great is my distress till it is over!” (Luke 12:50) - and Marcelo’s crucifix incorporates strong baptismal themes. Above the Crucified is the image of the dove which descended from Heaven at Christ’s Baptism by John in the river Jordan. The figure of the prophet Ezekiel is on His right side with the inscription “Vidi aquam egredientem – I saw water flowing”. On His left side is John the Baptist with the inscription “Ecce Agnus Dei – Behold the Lamb of God”. The body of Jesus is immersed in flowing water which symbolises the new life which Holy Baptism effects for us through His Saving Death. Finally beneath His feet is the figure of Jonah emerging from the mouth of the whale, an episode which foreshadowed the Death and Resurrection of Christ. Although the St Barnabas Society is open to providing help to former clergy and religious of other world faiths the majority of converts who make contact with us are from other Christian denominations. As a consequence there is a precious gift which they bring with them on their conversion journey and which they already share with their Catholic brothers and sisters. It is their Baptism. 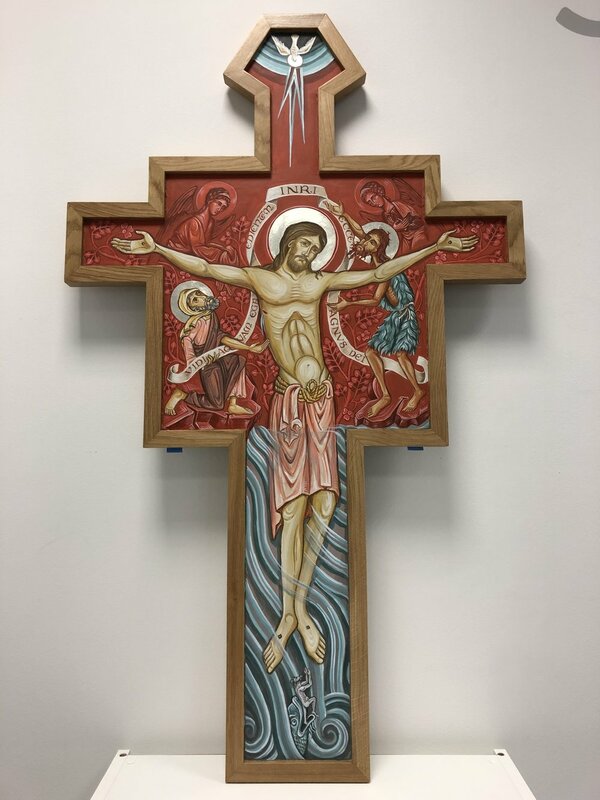 Marcelo’s beautiful crucifix will be a powerful reminder of this as it hangs above the altar where the Sacrifice of the Lord is perpetuated. It is much more than a beautiful work of art. It is a powerful symbol of the life made possible for us by the Death of Jesus – a life in which we totally share within the fold of His One, Holy, Catholic and Apostolic Church.